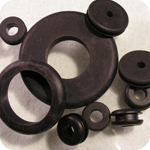 Metal O-Rings – Atlantic Rubber Company, Inc. While elastomers continue to be a common choice for o-ring production, metals offer better temperature, pressure and corrosion resistant capabilities. These essential properties and others allow the use of this particular type of o-ring in aerospace, nuclear, power generation, semiconductor, oil and gas industries. Metal o-rings are discs that are placed in piping, tubing, valves, vacuums and the like to create an impermeable seal within a joint, thereby blocking the passage of gases or liquids. Metal may be used in dynamic joints, though it is best suited to static compression. When in place, the o-ring creates a four point seal unique to metal rings. Metal rings may also have plastic jackets, which abandon the four point seal in favor of the full contact of an elastomer product. Compression deformation causes the rubberized coating to spread and fill any cracks and gaps that might be found in the surrounding materials. Just as metal o-rings sometimes utilize plastic attributes, metals such as carbon are used as fillers for elastomer compounds to prevent electrical arcing and static sparks. There are three basic types of metal o-ring seals. Plain, self-energized and pressure-filled o-rings are all formed using die casting methods. Aluminum, nickel, silver, copper, steel alloys, inconel and gold are common materials utilized in the production of o-rings. There are also plastic based o-rings on the market, commonly cut from synthetic rubbers like viton and silicone. Additionally, Teflon, cadmium, copper, nickel, silver, gold and indium may be used to plate or coat rings to increase corrosion resistance, fit and strength. Metal o-rings can also be heat-treated, age-hardened or annealed. The finishing requirements are determined by the specific use of an o-ring and the materials it will contain. Heavy liquids, for example, do not generally require coating. Volatile fluids and gases such as helium or hydrogen, however, should be handled with extreme caution. Coating an o-ring containing volatile fluids will not only improve the quality of the seal, but act as a safety measure as well. When selecting a base material or top coating, a buyer must also consider the temperature requirements of an application, since the useful temperature range of metal o-rings varies from -450°F to over 1300°F. No matter the material, o-rings play an integral role in the safe operation of many machines and must therefore be subject to rigid visual and dimensional inspection. Material, finish, temperature range, pressure range, vacuum range and diameter should all be carefully considered in the selection of a metal o-ring. Metal O-Rings Metal o-rings are round, disc shaped devices used predominantly for sealing applications in a broad array of industries, though they are also manufactured to suit a variety of alternative industrial purposes.